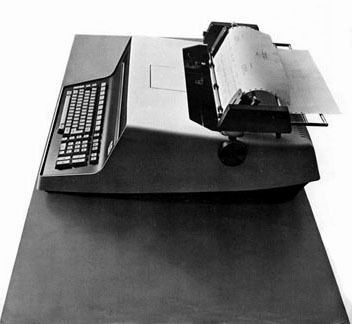 Photograph of the desktop console of the world's first microcomputer system. It utilized the Intel 8008 single-chip microprocessor. The computer system was developed and manufactured by Q1 Corporation. They delivered the first microcomputer system to the Litcom Division of Litton Industries in Melville, Long Island on December 11, 1972 (and a second system in February, 1973). In April 1974 Intel introduced the second-generation, single-chip 8-bit microprocessor, the 8080. Until then, Q1 systems were the only self-contained, general-purpose microcomputer systems in the world. In 1973, two limited-purpose products that utilized the 8008 were introduced: In May 1973 Micral, in France, introduced a special-purpose process controller; and in the fall, Jonathan Titus offered the Mark-8, an 8008 assembly-kit for the hobbyist market (Titus 1974). Neither product was, nor intended to be, a self-contained, general-purpose computer system. In 1973, Q1 microcomputer systems were installed in Europe (Germany) and Asia (Hong Kong). The Q1 System remained the world's only self-contained, general purpose microcomputer system until Intel introduced the 8080 second generation microprocessor. Apparently, Q1 also delivered some of NASA's computers. see more Q1 Corporation Q1 System Ebay auctions !